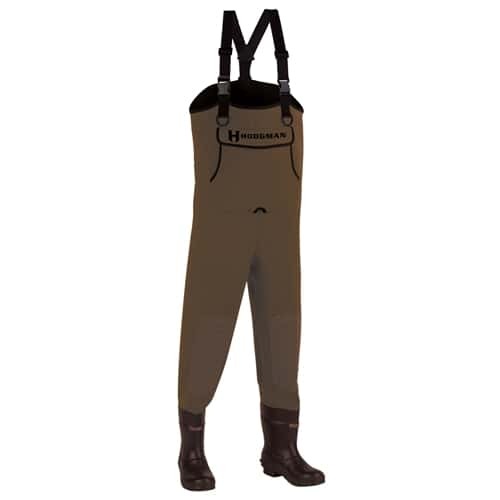 When the weather turns cooler Hodgman® Caster® neoprene bootfoot waders are the perfect choice for hunters and anglers. The 3mm neoprene construction provides ideal flexibility and increased mobility. The knees are reinforced and padded for added durability. All seams are taped, glued and stitched to protect against leaks and provide long lasting performance. A durable rubber boot includes 200g of Thinsulate® for added warmth and the felt outsole ensures optimal traction. A fleece lined hand warmer pocket keeps the chill from biting into your hands and the large top loading storm pocket is perfect for storage. D-Rings are included on the front and back of the wader for accessory attachment.